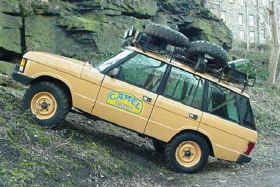 ...by no means does the picture of the Camel Trophy Rover indicate it has a chevy engine! PLEASE SEND SO WE CAN SHARE AND LEARN, THANKS. Aftermarket carburetor and aluminum intake for non-ECU conversion. Marine carb may allow better off-road off-camber vehicle operation. Obtain ECU with complete engine purchase from wreckers Mount ECU in passenger compartment IF wiring harness is long enough, may need to extend factory harness. Or, mount in engine compartment as in factory GM installations. Local shop can connect Rover Y-pipe to exhaust manifolds. Possible solution is a gear-reduction Hi-Torque starter with a more slender extended nose. Unknown if you'll have to upgrade radiator. In the magazine article at the top of the page, it sounds like they used the factory RR radiator with only a plumbing change. in advance of a GM swap. This way you aren't spending twice, and if you never do a swap, you still have an upgraded cooling system. Possibly can use braided steel lines custom cut. Or, if radiator is custom made, place inlets/outlets in similar position for a known vehicle and use hoses from that. The engine's water inlet/outlet are well known, the variables are radiator inlet/outlet and distance between engine and radiator. Upgraded front springs and shocks are needed. Many sources for these items. Existing modifications already allow for Delco conversion. Possible solution is to use GM pump and reduce pressure if needed using conventional hydraulic pressure reduction tactics. Variable restriction valves are commercially available. Need to find specs on the GM steering pumps to compare with Rover pump output. Full lock/1000rpm- ? psi max. Possible option: Saginaw or AGR box. More Info anyone? Will the ZF shift without any input from the OEM ECU? Does ECU control cruise, or is it a separate control box? If separate, we can likely make it work with new system. Verify Chevy Oil Filter clearance. Will oil filter interfere with anything? Marks Adapters- Only source found so far. Sell adapters and motor mounts. http://sandm.alphalink.com.au/ More Chevrolet transgressions... from the AU no less! Overfinch- Will NOT sell components individually, they will only install them at their own shop. Samurai Eng, UK, Phone # 01297552234 - ? web address anyone? If your really like your Rover and plan to keep it for a long time, a conversion like this would pay for itself in a couple of years, all the while enjoying the benefits and pleasures of the Chevy. If your looking for and need extra Horsepower & Torque, reliability, longevity, low repair cost, replacement parts available at your local parts store today(not special order, next week). General Motors (Chevrolet) has spent hundreds of millions of dollars over the years developing a variety of parts for their cars that were both tremendously reliable and manufactured at a reasonable cost, why not take advantage of that?? True enough, a performance built 4.6 motor is a great way to go for some extra horsepower. A very well built 4.6 'Stage 3' motor with a good camshaft, head porting/polishing, increased compression, performance chip and anything else you might want to do to it, still may only produce 275hp and 300ftlb torque(ie:RPI Stage 3, 4.6lt motor). Where as a warmed up Chevrolet 350 motor, can easily reach(without trying) 350hp/350ftlb torque, without spending alot of money on exotic modifications. With the Chevy motor, you can keep the compression ratio down at 9:1 and still ran regular unleaded gas, saving you alot of $$$ in the long run. Also the fact of reliablity, low maintenance, readily available parts are a built in PLUS for this conversion. I have nothing against the Rover powerplant, but as a Rover mechanic, I sure replace alot of Rover engines each year. Don't take it the wrong way, I think Rover has an excellent vehicle. You couldn't have a better box frame, front & rear differentials or transfer case, but as far as the aluminum Buick V-8(era 1961-1968)motor, it's a little out-dated. 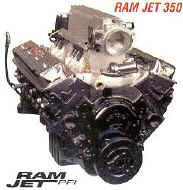 A rule of thumb," MORE POWER=MORE CUBIC INCHES", no other way around this. Why not have the best that both worlds can offer, Englands' Land Rover and Americas' Chevrolet. Considering Rover already uses a Buick V-8, it really wouldn't be to far out of the norm to utilize a Chevrolet V-8 replacement powerplant. I've been a mechanic for 25 + years, working on British/Europeon cars, and can see there is room for improvements with some of there powerplant/drivetrain systems. Why not opt for a tried-and-true system, like a GM(Chevy) drivetrain, since they have worked out all the bugs and have limitless combinations of readily available parts at such reasonable prices. It seems that over the years I've heard the frustration expressed by so many Land Rover/Range Rover owners that their 3.5, 3.9, 4.0. 4.2, 4.6 (Buick GM) engine just doesn't have the power and torque that they'd like or need. All kinds of attempted solutions have been tried, and many times the fix has ended up causing more problems and expense that anyone bargained for. The EFI system could either be a GM factory computer which is programmable with some aftermarket programmers, or you could opt for a Accel EFI system with Laptop programming. The later system is infinitely adjustable for any engine combination, and is the most user friendly system available. All newer EFI systems incorporate Knock sensors to control the ignition timing, this is to prevent serious detonation and pinging problems, whereas 1995 and earlier Rovers have no Knock sensors(no timing control). When using a GM EFI system, you can have the vehicle serviced at almost any repair shop across the country, very convenient. This 350/700R4/LT230 is a real cool combo, it is a total turn-key package by itself. The Chevy motor / transmission conversion incorporates an adapter plate, that mates up to the LT230 T-case. With all these conversion options available, horsepower and torque ratings, I like to approach and adhere to a "driveline protection" philosophy. This of course, would be to minimize the possibility of breaking parts in the balance of the running gear (axles, differentials, u-joints and etc.) setup. An upgrading of these parts may also be addressed, if desired. Due to the fact that most conversions require a lengthy explanation, e-mail is not always the most thorough and expedient method of communication. You can reach me at 405-790-0167, for a one on one look at your conversion needs, just ask for Bill Jansz. It all has to do with CHOICES, and thank goodness for these different options. I'm trying to give Rover owners a broader platform to choice something that will fit their personal needs, that's all. This Chevy conversion is not for everyone, it's for those who want an alternative solution. Thanks again for your inquiry, Bill Jansz. Bill, what info did you have regarding your post on the clrc site?